An Egyptian biographer and an American professor claim that the Mubarak family is worth from $40 to $70 billion, according to ABC News. Experts say the wealth of the Mubarak family was built largely from military contracts during his days as an air force officer. He eventually diversified his investments through his family when he became president in 1981. The family’s net worth ranges from $40 billion to $70 billion, by some estimates. 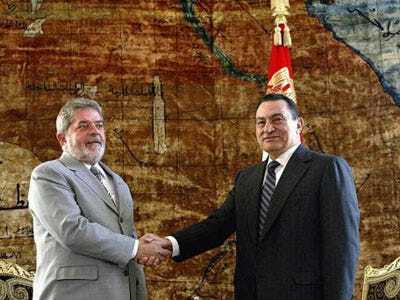 $70 billion would put Mubarak somewhere between Carlos Slim and Warren Buffett in terms of wealth. Is this realistic? It could be when you consider that he spent 30 years as the ruler of a large country and American ally. Mubarak’s family is said to own properties in London, Paris, Madrid, Dubai, Washington, D.C., New York and Frankfurt, according to IHS Global Insight.